I HAD high hopes for the weekend. 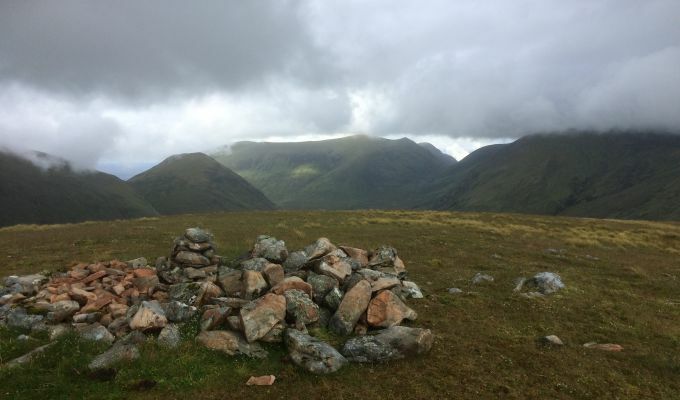 Four days based at Corran, four days walking in the beautiful hills of Ardgour. The problem with planned meets, however, is that you have to take whatever the weather throws at you. And it had plenty to throw. A slow-moving low pressure system stuck in the west. Rain, rain, rain and more rain. Sometimes the long-range predictions can change dramatically, but this one never budged. The Wet Highlands forecast was bang on. So the plans were modified, scaled down to shorter, less ambitious days. My targets over the water would have to be left for better days. In preparation, I invested in a pair of Sealskinz socks to go with my Sealskinz gloves. All I needed was a pair of flippers and I would be fair game for a clubbing by any passing hunter. 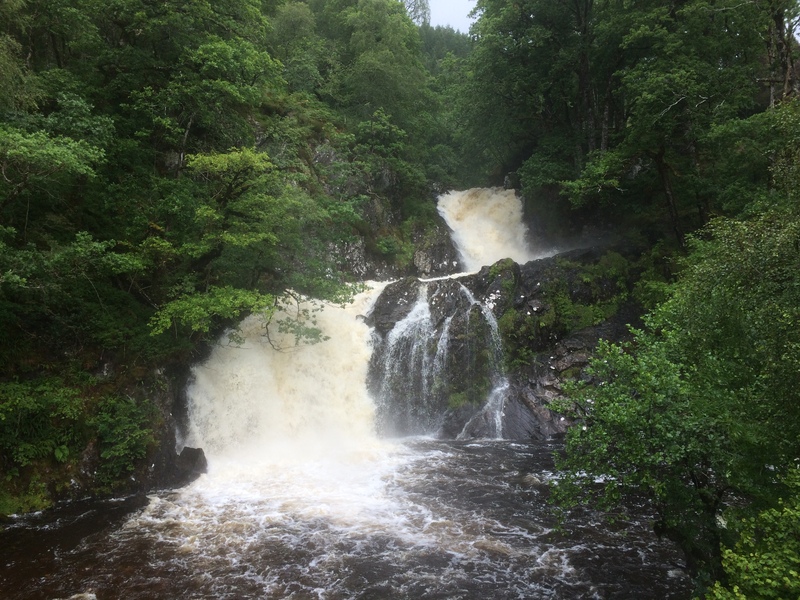 Splashed along the waterlogged Loch Arkaig road, short stop to watch the falls at Eas Cia-aig thundering down. Impressive. As I set off from car, two drenched figures appeared, returning from my objective, the Graham, Glas Bheinn. Not so impressive. River crossing, raging white water, so diverted upstream and crossed with delicate balance on dodgy, collapsed fence. Pushed steeply uphill in deep, wet vegetation. Moody, dark skies and beautiful, contrasting bursts of light as rain pulses pushed up the loch. 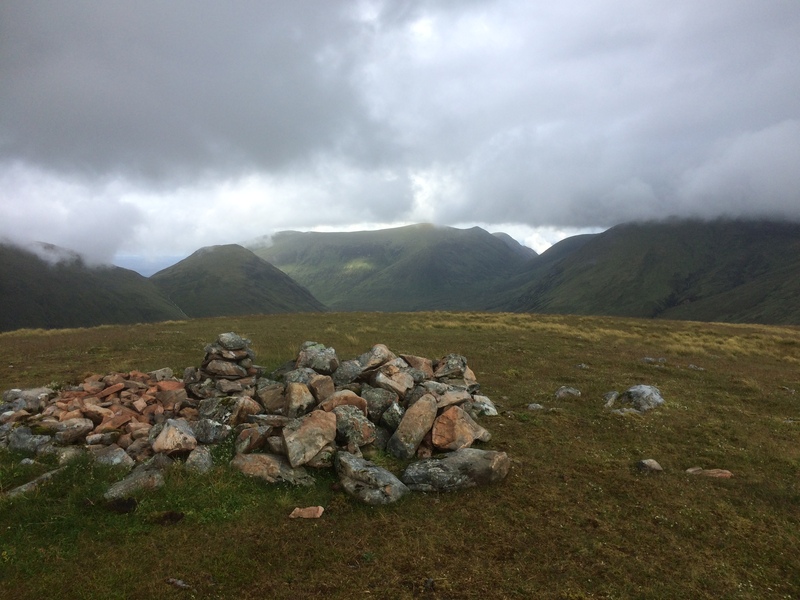 Reached summit in between drenchings, views to Meall na Teanga peaks opened up briefly before next wave swept in. Heavy, continuous rain all the way down. Relieved to find good drying room at Corran. Decided to stay local after a night listening to rain battering on the skylight. Walked short distance to Inchree under laden skies, waterfalls in spectacular form. Uphill push through long, wet grass. Didn’t take long for visibility to vanish. Squelched across boggy col to Beinn na Gucaig trig point. Fast retreat as rain got serious. Reached road with water sloshing around in boots. Met two guys in wet suits on way down. Thought it was a bit much for hillwalking but turned out they been canyonning. One was injured, struggling to walk. Who would have thought jumping off rocks into raging torrents could be dangerous? Early rain cleared so drove round Loch Linnhe to starting point for the Munro Beinn Sgulaird. Warm and pleasant (suspicious) for first hour or so, spotted rainbow over Loch Creran (bad sign), sheets of grey filling in behind (even worse sign). Darkness descended – or at least I rose to meet it. Views vanished, rain came on. And stayed on – for the next four hours. A quick nod to the summit cairn and down I went. Very windy now, heavy rain. Water running everywhere, began to doubt I was on same path I had taken up such was volume of water pouring down. Wetter than a hippo’s Speedos when I got back to the car. Felt like Groundhog Day - woke to rain pounding on skylight. Heading home, so decided on a short hill en route. Surprise, surprise, no rain when I parked in Glen Roy, and visibility much improved. Ten minutes uphill on saturated grass, rain came on, but mercifully brief. Decent views from the summit, dry all way back to car, but combination of early shower plus rising temps meant I was still soaked through. Thunderstorms on journey home, one so torrential I couldn’t see out the windscreen. Consolation was that I wasn’t still on the hill. Four days, four hill walks, each one the same result; every layer of clothing wet through, the water emptied from boots enough to fill a paddling pool. Summer in Scotland – remember to bring your scuba gear.